I hope you are all well. A few months ago I got an email from Khaema asking if I would be interested in trying out her wax melts. Well I am a hoarder of waxes and absolutely love trying new brands so of course I jumped at the opportunity. As with all the brands I work with I told her that my review would be honest and not influenced by getting products for free. So as long as she is confident in her product then we are good to go. Khaema has very clearly taken the time to consider her products and has put a lot of effort in to deciding how they will look. The products all come individually wrapped, so the scents don't become overwhelming in the box, which believe me I have had happen before. 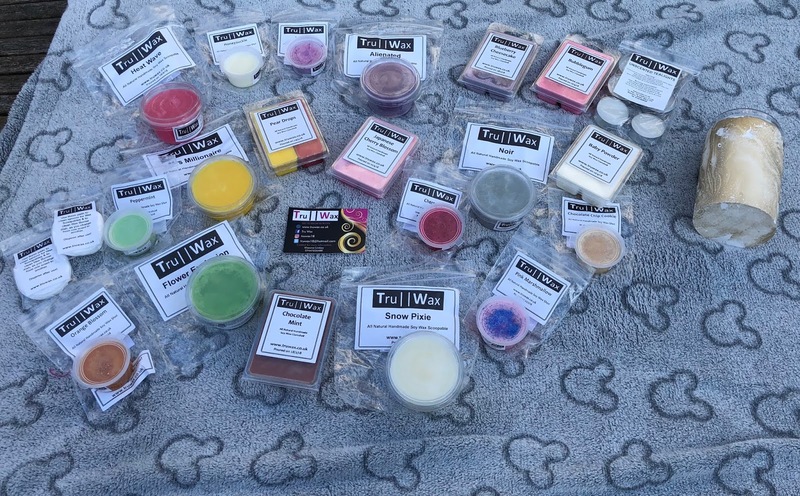 Khaema started opened tru wax in 2016 because she has a huge passion and love for all things wax and from then she has gone from strength to strength. She has trialled and tested so many formulas before finding the right one for her products. So when my box of wax arrived I was blown away. The box that she sent me was one of her gift boxes that is worth £50. There was just so much in that box! She had sent me three different types of wax that she offers. Shots, Clam shells and Scoopables. The shots are a great way to get to try a scent before buying a bigger size. The clam shells are great because if you are like me and change up often you just break off a block from the one you want and away you go. The scoopables are a little messy but I love the fact she has thought of this and sends a little spoon with the pot and also in this gift box she sends cotton pads to clean your dish and spoon. Her gift sets all include a very beautiful warmer. with the cutest little clear glass dish in the top. She had also put in the box a pack of tea lights, so with this gift set all I need at home is a lighter and I am all set. She really has thought of just about everything! 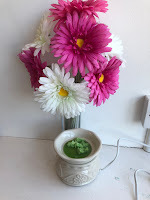 I have spent the last month trying the different scents and really testing them. I have tested them in different settings and warmers. I always find the tea light warmers give off the best scent as they are the ones that heat up the most. I also have been using them in the salon in my glade electric warmer and my clients are all complimenting the scents when they walk in. 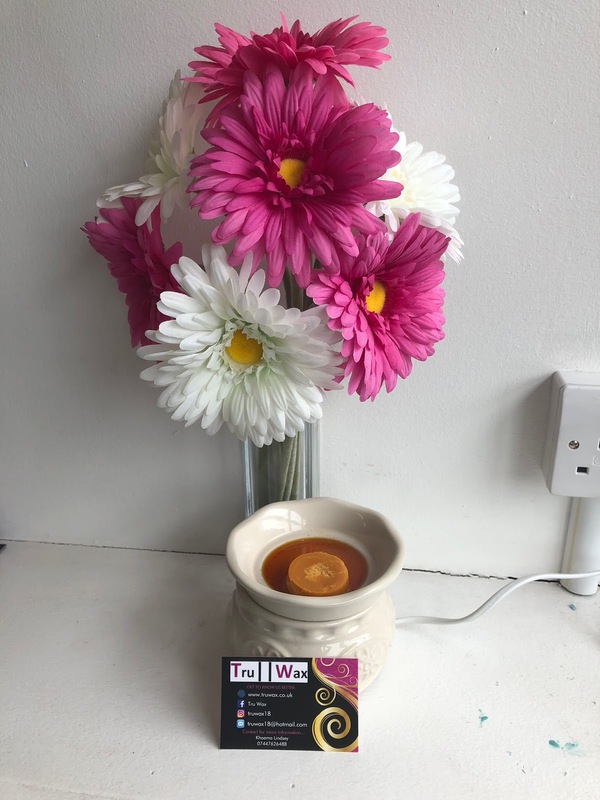 I have it strategically placed at the entrance so clients smell it straight away but you can smell them all around the big spacious room of the salon, which is an accomplishment on its own as many waxes the scent just does not travel. Finally I have also tried them out in my scentsy and normally they wouldn't give off a good scent because a scentsy warmer heats at a lower temperature, but because this product is softer and made of soy it works great in a scentsy. The scent options are so varied and are really well put together. She has created perfume similars. So we have a melt called Flower Explosion that smells very similar to a certain Viktor and rolf perfume, we also have Alienation which smells very similar to... well you get it. She has been very creative with the names, but allows us to work out where she got the inspiration from. There are also some classic options like Baby Powder, Pear Drops and Rhubarb and Custard. There is a huge range of scents and I know you will all find something you love. The website is very easy to navigate and everything is laid out perfectly. A lot of time and effort has gone in to making sure that everyone can find exactly what they are looking for and pricing is easy to see. She has bundles and gifts sets as well as just being able to purchase the different types. From £2 - £4 these waxes are definitely within the budget of someone trying to save a few pennies. I am so pleased to have been given the chance at trying out these fab products and cannot wait to see what I am going to get in my next bundle. I already have a huge list of different waxes from the website. Thank you all so much for reading. Let me know in the comments what your favourite wax brand is and if you have tried this brand yet! !